I will be honoring a new one-day special each day until December 12th for both my Shaklee Family Members and Members-to-Be. DAY 1 Get a FREE Vitalized Immunity with Life Plan purchase. Expires midnight Tuesday, 12/1 Second chance sale on 12/12. Your friends and family may or may not forget a gadget you get for them, but they will not forget that you helped them feel better every day, or invested in getting and staying healthy yourself, so you could be a part of their lives for a very long time to come. I hope you will check out my posts each day and see if there is an area of your life that I can help you with, or perhaps your friends and family members would want to know about. 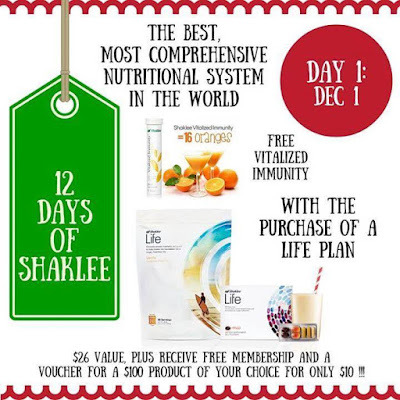 Each special comes with free Membership, if you are not already a Shaklee Member. Thank you for supporting my small business this holiday season! log on to your account at http://myshaklee.com/ to place your order.